Licenses: Hunting License required. WMA Permit is required when hunting on WMA Land. Limits: Statewide bag limit is 12 birds/day. Some WMAs may have more restrictive limits. Bobwhite quail are predominantly reddish-brown, with lesser amounts of white, brown, gray and black throughout. Both sexes have a dark stripe that originates at the beak and runs through the eye to the base of the skull. In males, the stripe above and below the eye is white, as is the throat patch. In females, this stripe and throat patch are light brown or tan. Typical weights for bobwhites in South Carolina range from 160 to 180 grams (5.6 to 6.3 ounces). Overall length throughout the range of the species is between 240 and 275 millimeters (9.5 and 10.8 inches). Average life span of a wild bobwhite is less than 1 year. 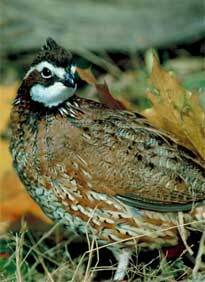 Bobwhite quail use a variety of cover types throughout their broad geographic range. Early successional habitats such as croplands, grasslands, fallow fields, open pinelands and open mixed pine-hardwood forests that have diverse groundcover vegetation are particularly important in South Carolina. Stands of perennial warm-season bunchgrasses (i.e. bluestems, Indian grass) are the preferred nesting habitat throughout much of the range of the species. Preferred brood-rearing cover consists of diverse communities of erect annual forbs (i.e. ragweed, partridge pea) with abundant insects, bare ground between stems and a foliage canopy. Each year in Early March, the DNR Small Game Program and cooperating partners conducts a Wild Quail Management Seminar at the James W. Webb Wildlife Management Area in Hampton County. For more information visit Wild Quail Management Seminar. Statewide. Bobwhite quail occur throughout South Carolina, with higher densities found in the coastal plain than the piedmont. Within the coastal plain of South Carolina, quail population densities are higher in the inner coastal plain than in the outer coastal plain and coastal zone. Greater concentrations and more wide-spread distribution of row-crop agriculture in the inner coastal plain creates habitat conditions more favorable for quail than are found in heavily forested landscapes typical of the outer coastal plain and piedmont. Adult bobwhites are almost exclusively seed-eaters, consuming the seeds of grasses and other native plants. Seeds of native legumes are an important late-winter food source. Waste grains, especially soybeans, corn, and wheat are an important food source. Bobwhite chicks require a diet high in protein for the first few weeks of life. This protein requirement can only be met through the consumption of insects. Mid-June through end of July. Begins as early as April, and may continue through September. Male whistle to attract a mate, with peak calling generally occurring between mid-June and mid-July. Clutch size averages about 14 eggs. Both male and female bobwhites share incubation duties. Incubation lasts approximately 23 days. Bobwhites form social groups called coveys in the fall and winter. Coveys roost in a circle, with individual birds all facing outward from the center of the circle ("roost rings" are circular piles of droppings left by a roosting covey). Annual mortality of bobwhites is extremely high. Providing abundant, high-quality nesting cover, brood-rearing cover, and escape cover are keys to increasing and maintaining quail populations at the local scale. Quail season in South Carolina opens on the Monday before Thanksgiving and closes on March 1. The daily bag limit is 12 birds. 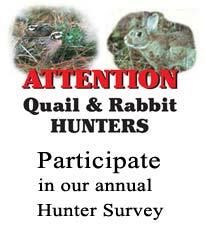 Quail hunting is allowed on most Wildlife Management Area (WMA) lands during the statewide season. However, certain WMAs may have additional restrictions on quail hunting, and hunters should refer to the SC Rules and Regulations brochure for information on quail hunting on specific WMAs.